Police are seeking information following an armed robbery in the Capital. A three-figure sum of cash was stolen during an armed robbery which took place around 10.15pm on Tuesday March 20 at the Candy Land store on Gorgie Road. Two women aged 25 and 16 were working within the shop when a man entered and presented a knife demanding money. The suspect made off from the area, running east along Gorgie Road. Inquiries are ongoing to trace the male responsible and anyone who can help identify him is asked to come forward. He is described as white, 20-35-years-old with an average build and wearing dark clothing and gloves. He spoke with a local accent and had a hood up obscuring his face. 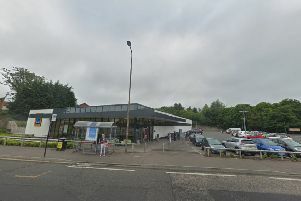 Detective Sergeant Todd Rutherford from Corstorphine CID said: “While neither of the shop workers were injured during this robbery, it was a very distressing incident for them both and we are pursuing a number of lines of inquiry to find the suspect. Those with information can contact Corstorphine CID via 101 and quote incident number 4261 of the 20th March. Alternatively, an anonymous report can be made to the charity Crimestoppers on 0800 555 111.